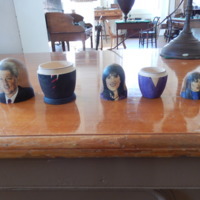 As a novelty item, this is a five piece hand painted nesting doll set featuring President Clinton as the tallest piece while he is in a black suit and tie. 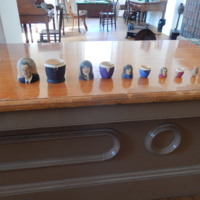 Hillary is the second smallest next to the piece depicting the horn. The theme is obviously associated with the Lewinsky-Clinton scandal. These pieces are unique for two reasons. Not many pieces of this subject matter depict the characters faces as does the Church collection. Not many of these types were made based on my search results. Therefore, not much is known about who made them or when, but it was probably around 1997. 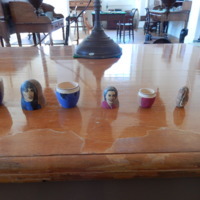 Nesting dolls are a cultural phenomenon in Russia where they started out honoring their past presidents, but after the fall of the Soviet Union, an interest developed to highlight American personalities and Presidents. Bill Clinton served in office between 1993 and 2001. 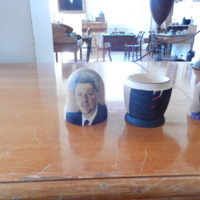 “Russian Nesting Dolls President Clinton 5 pc ,” UIS History Harvest, accessed April 24, 2019, http://uishistharv1.uis.edu/items/show/204.